Halibut is in season. 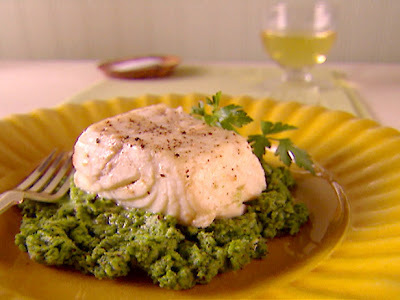 This is not usually cause for celebration in my world, until this Friday night when my friend served Grilled Halibut with Pesto. It was so good I made it again on Saturday night. White, flaky fish can be bland. Too many added ingredients can overpower the subtle flavors. This 20 minute dish has perfectly balanced flavors, and more importantly . . . it looks really pretty on the plate. I topped it with grape tomatoes and chopped basil. Halibut with Pesto Place halibut on foil lined cookie sheet. (Ask for the skin to be removed at the fish counter.) Brush with extra virgin olive oil. Sprinkle with kosher salt and freshly ground pepper. Squeeze half a lemon on top, and bake at 375 for 15 minutes, or until fish flakes easily. Spread pesto on plate (store bought is quick, but homemade pesto is more fun.) Place halibut on top, and top with sliced grape tomatoes and chopped basil.